I’ve mentioned to a few people on Facebook and Twitter that I am a huge fan of Alarm.com and the features it provides. When we built our house we decided to use one of their local dealers to handle the installation and monitoring. They then tied the system into the Alarm.com system for management. We integrated our Liftmaster Garage Doors into the app, ZWave switches will be coming soon, and we also used some of the native Alarm.com Cameras inside and out. Recently they released their Stream Video Recorder (SVR) and I got hold of one to test out and found some interesting things. This is the very first thing you want to be aware of. They seem to have two models called the SVR-1001 and SVR-1002. The first is marketed as a 1TB version and the latter a 2TB version. They also claim there is the ability to use 2TB drives in either one, so it led me to ask myself….does one have 1TB and the other 2Tb drives? Also how many are pre-installed since there is 2 available bays and mirroring. Well the answer is simple. I have the SVR-10012 and it arrived with dual 1TB drives pre-installed. They are marketing the SVR-1002 as 2TB TOTAL capacity. As best I can figure out there is no version with pre-installed 2TB drives. Therefore my guess is the SVR-1001 just has the one drive installed. The price difference is $525 vs $650 and what really burned me up was these use the Western Digital Purple Surveillance Drives. You can get a 1TB one off Amazon.com for about $62 and they are charging $125 for the additional drive. My conclusion is that they need to fix and clarify their marketing so just be aware if you pick one up! That being said you may also want to just get the 1TB version and pickup the second drive from Amazon.com or even just order a couple 2TB ones for that matter. Okay, now that the specifics of the drives and capacity is out of the way, I also found out that each unit is 4 channels, so it can record four cameras only to each unit. I also set the recording quality to the maximum to test the amount of days the 1TB will hold. I only have 1TB capacity because I always mirror drives no matter the claims by Western Digital about 24×7 reliability. You also get access to all the recordings through the SVR Timeline view where you can reply any of the streams and even download the video. You can also access this same timeline from a mobile device which is cool. I got a delivery notification of a package and I was able to confirm it’s delivery by accessing the timeline around the time the notification said it was dropped off. Then I was able to call a friend to grab it and tell them exactly where it was. So that’s pretty cool! The only thing I don’t like is even though the device is 100% local you can only access the recordings via your account web portal login. So if that is down, you don’t have direct access to your videos on the device. This needs to change ASAP in the firmware in my opinion. Alarm.com needs to work in a simple local apache web browser to access and download the files locally in the event of lost internet access. Also, frankly 4 channels is not enough and the desktop form factor is not great for everyone. They need an 8 or 16 channel rack mount version for this to really take off in larger homes. All in all I love the fact it just works, it’s easy to setup and configure. Being that it’s brand new, it’s not a bad 1.0 version, but could use some work to enhance it for larger customers. I hope they read this and take some of my opinions to development and marketing for that matter. The 1TB/2TB confusion is something most dealers I’ve chatted online with cannot even explain! Not for Alarm.com cameras the only way to access the data is through an ADC streaming recorder or through their site. If you used Ubiquiti cameras or another vendor they have their own local recording devices you can access separate from ADC service. Chris , do you know if this is compatible with vivint… as all the cameras and app are the same.. Highly doubtful. My experience even with the ADC cameras is that ADC loads custom firmware on them for their service to locate them and activate them. You don’t have any direct local access to their devices, so my guess is probably not. These are for use only with ADC cameras and accounts. Actually you can. They are still same manufacturer. The only thing you can’t change of vivant is the panel. There card is directly theirs. Everything else though is good to go. Lots of documented cases where ONLY if you add a user before you connect to ADC can you access it sideways. Once it is connected to ADC they create a new root password and you cannot add the new user. Also recently saw a post that an update wiped out the side loaded user. I guess if you are talking about using them for ONE or the OTHER then you could use it with vivant, but most posts about these units once controlled by ADC you can’t control them with something else. So Assuming you bought an ADC camera for use without ADC, then anything is possible. The app and the account software look exactly alike.. Actually when I log in to my live video, it goes to alarm.com – I think Vivint and ADC had a partnership at one time.. all the cameras are the same. .and the website features.. just swap out ADC with Vivint..activating cameras etc. .exact.. I wish I knew a place where I could try out the SVR to see before spending $450..
Like I said the firmware on the ADC-SVR is specific to activating it on their service…when you plug it in you have to log into an ADC account to “Add new Device”. If you wanted to try it any other way to mess around and not assign to an ADC account you’d have to buy one most likely. Also I cannot actually pull the video off the SVR locally I have to log into my ADC account to view/download the recordings. Even though the device is local on my LAN there is no direct interface into it that I have found. Hi Chris! I would like to know if I can connect the ADC-SVR to a hot spot device (ATT Unite Explore) and the answer is yes, how much data use. The SVR has no WiFi capability so doubtful that can be done. Also if you could you’d not pay data for the local cameras to record they go directly to the SVR via the local network, but pulling the recorded streams you’d use data from the ADC.com app/site. Cannot say how much data that would be depends on the video size and how long you stream it for but the camera to SVR is direct. Any idea if there is an easy way to reformat the hard drives? I think you can reset the device from the ADC website or there may be a way to reset on the device itself which should reformat the drives. I think removing and re-adding the device will also reset the drive formatting. Thanks Chris. Removing individual cameras and then re-adding them deleted stored video. I just purchased the 2TB device from ADC. I’ve had nothing but trouble with it. The blue lights often flash indicating that it is connected but not recording. When I playback any segment, it pauses, buffers and I often get “Camera not recording at this time”. My alarm company tech who installed it is scratching his head as well. I’m returning the unit. If the lights are flashing that means it’s not recording b/c it’s not getting a feed from the cameras. Are the cameras also ADC cameras? You configure the stream recording from an ADC camera to the device once the device is on the network. The stream is sent directly from the cameras to the device on the same LAN segment not over the internet. It sounds like a camera to SVR connectivity issue. I have 8x Alarm.com cameras and 2x SVR units setup for my house. Both SVRs are configured identically (with 2x mirrored 1TB drives). 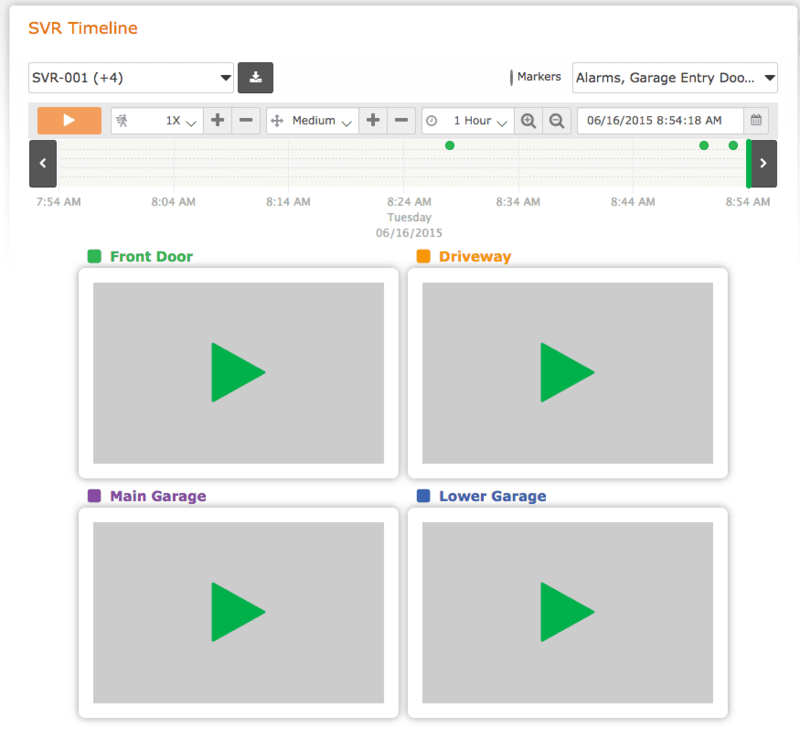 Installation and setup was indeed straightforward, but I have a major gripe with the SVR Timeline interface. It takes ~10 seconds of buffering to watch ~1 second of recorded video. To make matters worse, there’s no way (at least that I’m aware of) to queue-up a predefined date and time in advance for review at a later time. NOTE: All of my Alarm.com equipment (i.e. cameras and SVRs) are logically and physically segmented from the rest of my home network. Additionally, all of my Alarm.com cameras have hardwired network connectivity (i.e. no Wi-Fi connected cameras). Have you experienced similar issues? Maybe you’ve figured out a better way to review video footage from an SVR? I look forward to hearing back from you… Thanks in advance. I have a similar setup. Dual SVR’s and 4 camera feeds each. I happen to have mirrored 2TB drives as I upgraded them to get more HD recordings. I have all my cameras and SVR’s on a separate VLAN. SVR’s are connected via Gigabit and cameras are POE V720 models so no wireless all hard wired. I just tested with the new ADC web portal and I had no issue selecting a random day/time and even moving the slider to a specific time and playing the video. It Took some time to make the initial connection to the SVR but the video playback was pretty quick. I also filter down to 1 camera when I am looking for playback of a specific time. If I need multiple views I don’t pull all 4 at the same time to save processing on the SVR and network bandwidth. The only thing I am not 100% sure of is if you are on a routable subnet to the SVR if they offload the playback directly between laptop and SVR or if it actually goes out and back in. I’d have to packet trace that. I could capture a quick video but it was actually not too bad outside of the initial connection. Thanks for responding, this is GREAT feedback! At least now I know the system is capable of working better than it currently is for me. I reached out to Alarm.com for assistance troubleshooting the issue and they asked me to check the speed of my Internet connection; which leads me to believe the SVR is sending data to the Alarm.com portal before displaying it in my web browser. I’ll report back with their response. All of my Alarm.com equipment is switched on a dedicated 100Mbps Ethernet network. I didn’t think Gigabit would make a difference since all of the Alarm.com equipment is only rated for 100Mbps, but maybe it does since that’s one difference between your setup and mine… Thoughts? Like you described, I also filter the SVR Timeline interface to a single camera… But it doesn’t seem to make a difference. I also noticed there was firmware updates. The best part? The updates DOUBLE the recording channels so each channel really has 2. I already added a 5th channel to each of mine so looks like they are doubling down on the 4 channels that were there. My stuff is connected at 100MBps on my gig switches, but I also have 150/20 Comcast business. It’s going to be your upstream that you want to look at if they are in fact pushing through their side back to your browser. I have long asked them to allow a direct connection to the SVR so as to leave the internet out of it to get the file data off the SVR if needed. You can just log in and it will tell you if an update is available. Not sure the minimum version that supports it. Hmm, the first rule of Fight Club is… Check for updates before complaining about anything technology-related! I just checked for firmware updates and my SVRs needed updating. I’m going through and checking all the cameras too. Hopefully, this update will make a difference in performance. I’ll keep posting updates here as they develop. Also, just for context… I too have Comcast Internet service (100Mbps down / 15Mbps up). Well, well, well… A simple firmware update completely fixed the issue I was experiencing – Wonderful! WOOT!! Glad it worked out. Now you can also play with 8 channels instead of 4 as well :). I like the new web portal UI too. If I get an SVR and have clips still.. how does it work? is the cloud “clip storage” separate completely from the SVR recordings? Yes the standard cloud clip storage is completely separate. The clip lengths are smaller as well and can be configured to send to cloud when the alarm is triggered. The SVR ones are “always on” and will revolve based on when the storage is full. Does it work with adc-722w ? Or has to be POE hardwired to the svr? I would say it probably does. I don’t have any wireless cameras but as long as the wireless camera can communicate with the SVR I don’t see why it wouldn’t work. Can the Alarm.com SVR be connected to a monitor to view all cameras? No it can’t BUT you can get a FireTV stick inexpensive and use the alarm.com app on that connected to a TV. Since the streams are all Network based here is no direct TV connection but I’ve tested the FireTV setup and it works pretty well. My dealer wants me to charge me $190 to install and configure the SVR to my current existing Alarm.com system. Is there something special they need to do or can I purchase my on ADC SVR and configure it myself? Honestly, no he just needs to enable the SVR capability on your account which is basically a checkbox. Beyond that you just add a new device from YOUR side of the account. He’s got no reason to charge you for that. What is the recommended upload and download speeds for internet connection for SVR to ensure smooth streaming? I’m not sure that’s more a question for Alarm.com, but you will need some decent upstream for sure.